The Royal Sites of Ireland: Cashel, Dún Ailinne, Hill of Uisneach, Rathcroghan Complex, and Tara Complex is part of the Tentative list of Ireland in order to qualify for inclusion in the World Heritage List. The Rock of Cashel is an impressive site and should be protected. However, in the village of Cashel is the folk museum, covering many aspects of Irish history, however painful. I believe this too is worthy of consideration. I have visited it three times in the past 18 months, each time, improvements have been made and new artifacts added. 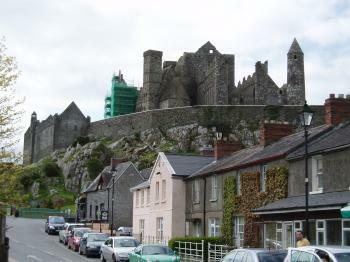 Located on a rocky outcrop in Southern Tipperary, Cashel is a nice place to stop on the way down to the South West. It sits up and dominates the landscape; it is pretty evident why this site was chosen for a fortification. There are many sites like this in Ireland boasting remains of a castle, a round tower, a ruined cathedral and a high cross. Cashel is one of the more impressive sites in the country and is well worth the time to see if you are heading down to the South; it is on the Dublin - Cork bus route, providing an ideal break in the journey. Whilst the remains are impressive, being one of the finest examples of Celtic art from the 12th-13th centuries, I'm not sure they would make it onto the list. Ireland does not seem as intent as other countries to use the list as a means to attract tourists and as such these sort of sites will not be promoted as they would elsewhere in the world. However I think this is a very impressive site and well worth a stop.